This entry was posted on February 17, 2016 by admin. Before being sent to Sicily my contingent spent some time in North Africa. On June 27, 1943 we were warned for draft, everything was very secret, we were confined to camp for a few days, not allowed to communicate with the outside world. We packed our kit and travelled by train through England and Scotland to Gourock on the Clyde where we embarked on the Nehalles. I’m put on Military Police duty in charge of 5 N.C.O.’s and 6 privates. We sail in a very large convoy. The crossing is smooth, even in the Bay of Biscay where it is almost always rough. We are escorted by some Naval Corvettes and two U-boats are rumored sunk, the sailors explode a mine with rifle fire. 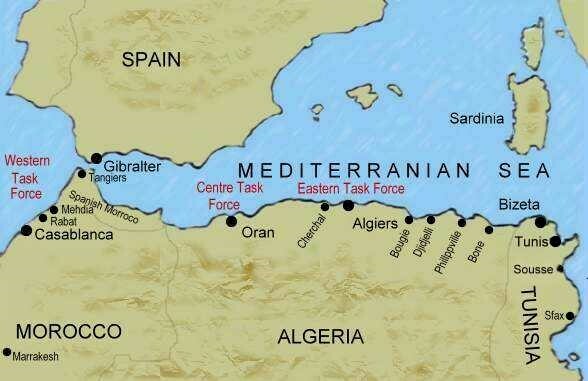 On July 9th we anchor in Algiers harbour after passing the Rock of Gibraltar. The following day we proceed to Phillipville in Algeria. We disembark in battledress and full marching order, the temperature is well over 100F, however, we are transported by truck six miles into the desert where we pitch our tents in Camp Cork Forest. Here we do route marches and weapons training. We are able to go swimming in the Mediterranean, the undertow is very strong in the bay and one of our fellows is unable to make it to shore. Our strongest swimmer goes out to bring him in, we form a human chain to help and manage to get them to shore, however are unable to revive him, our first casualty. We are able to get day passes to Phillipville, on the street we can buy cactus apples, roasted sparrows and other delicacies. The streets abound with boot-blacks who will shine your boots and when you pay him he’ll shine the other one. One Sunday we saw a large number of Senegalese troops being loaded aboard ships by their British officers, it turned out they had been offended by some slight committed by the Arabs and had gone on a rampage, killing 34 Arabs, 1 woman, 2 boot-blacks, and 2 jackasses. We heard later that after a court martial in Constantine 20 were executed. Water was rationed and very scarce in Phillipville; however, if you had a buddy who could speak French, the official language, you could usually get in the back door of a restaurant that served cold water and eggs fried in olive oil. Before we left for Sicily we had one sandstorm with temperature of 125F and winds that blew our tents down. On August 28th we put to sea in the Letitia bound for Sicily. Handlebar Hank and I were preparing to do some sashing. We were camped in an Italian farmyard. We had located a rope and bucket and were just hoisting a bucket of water out of the well when a mortar bomb exploded 200 yds. Below us, within seconds another landed above us, that are called bracketing. 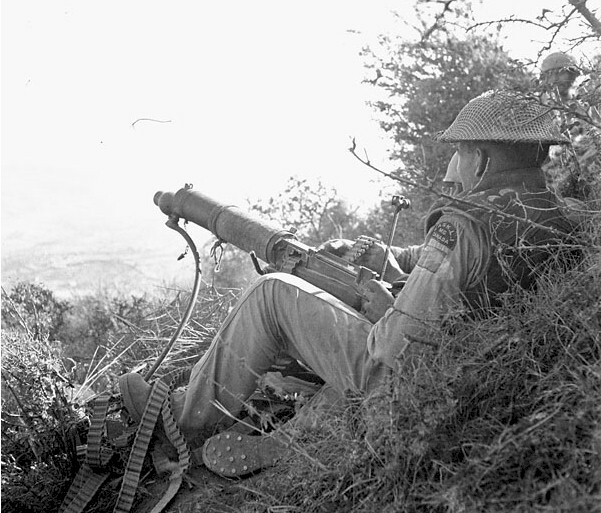 The next one would strike between them, we ran as hard as we could and dived into a gun emplacement which had been dug into the side of the hill by the enemy before they withdrew. The next bomb landed on the stone curbing of the well throwing shrapnel in every direction. In our panic we jumped up and ran behind the house which had thick stone walls. After we had time to think, we realized we were much safer in the dugout where we were protected on three sides, while the house only protected us from one side. This was a good lesson and I never again moved if I had a little bit of cover. Elliot suggested that we retrieve the rope and bucket as he urgently needed to do some laundry. We have been told that the enemy is on three sides of us so I was a bit nervous when Sgt. Reynolds assigned me to sentry duty from 3 o’clock to 6 in the morning. The night was very still and I could hear acorns dropping 100 feet away, fortunately the enemy left us alone. In the morning we scrounged some tomatoes and Ogimma, our cook, cut them up with some sausage for dinner, unfortunately he mistook a can of gun oil for cooking oil and we were all pretty sick for a couple of days. In the afternoon the Adjutant came out to try to sell us Victory Bonds, I agreed to buy one $50.00 bond, apparently he misunderstood and put me down for a one hundred and fifty dollar bond which pretty well cleaned out my pay book. It poured rain in the evening and by morning some of our trucks got stuck when we tried to move out. I guess the enemy heard all the noise and gave us a pretty thorough shelling, some shrapnel hit the trucks but we all escaped injury.